Riverside Avenue in Fordlandia, which was near the Tapajos River. This image was printed in Grandin’s 2010 book, FORDLANDIA. If you’ve read my work, you know that settings are something about which I’m passionate. A unique, vibrant setting always makes for a more interesting piece. I’d always wanted to write a story involving a place called Fordlandia—a city Henry Ford built in Brazil in the late 1920s so he could have his own supply of rubber for his manufacturing; a place that is now abandoned and overgrown. I finally got the chance when I wrote “Attempted Delivery,” which appears in my forthcoming collection, The Shadows Behind. Never heard of Fordlandia? Lots of people haven’t (when I mention it I usually get “what the hell is that?”) There’s a reason for that. The experiment in a utopia, meant to mirror a factory town in the Midwest—complete with a school, movie theatre, dance hall, church, modern hospital and paved roads (but no alcohol or tobacco)—was an unmitigated disaster. That’s the short version. The land was infertile, cargo had trouble reaching the city unless it was the rainy season, and Amazon wood—which Ford had hoped to sell in order to cover costs until rubber trees took hold—had no value. At one point the workers rioted. By 1945, Fordlandia was abandoned, nothing more than a broken dream. 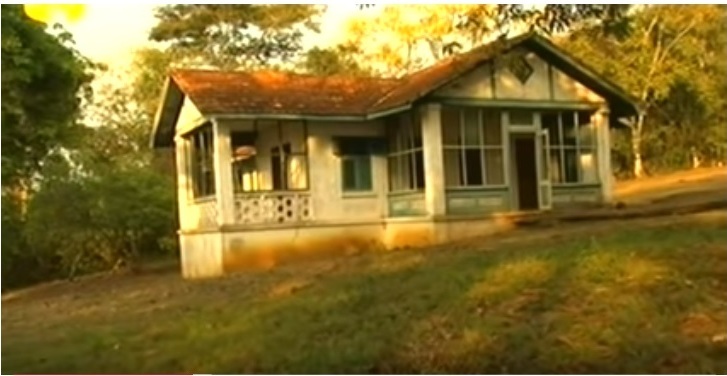 One of the houses that remains in Fordlandia today. This is a screenshot from a 2008 Spanish documentary on the subject.